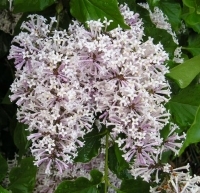 Very few large shrubs exhibit such a generous display of large, lush blossoms as the lilac. The traditional old fashioned plants perfume their surroundings with their unmistakeable scent for weeks on end. Lilacs come in all shades of white through blue, lavender and purple. There are also some newer hybrids with yellow, as well as reddish shaded flowers. The old hardy varieties have heart shaped dark green leaves and are the most fragrant. Newer varieties have been bred that have a somewhat different fragrance and some have hardly any scent at all. So if you want to grow lilacs and smell their wonderful perfume, be sure you select one of the old standards. Lilacs are not especially hard to grow. They require a climate that provides a winter chilling period and will not bloom in mild winter areas. The so called 'Descanso Hybrids' are reportedly able to thrive and bloom in frostfree areas, but we have tried several here in Florida and never got them to bloom. In fact they all succummed to the summer heat, even though they were planted where they received some shade during the hottest periods of the day. Lilacs can be planted in spring or fall and are not particularly fussy as to soil conditions, but require a well drained location. If your soil is very acid, adding lime to bring alkalinity up to ph 7.5 is all you need to do. Plant in an area where they receive full or partial sun. If planted as a screen or hedge, you can put them as close as six feet apart, otherwise leave 12 to 15 feet between plants to allow for unrestricted growth. They have a deep root system and are considered to be a low maintenance shrub with very little need of fertilizer. A handful or two of balanced all-purpose fertilizer, applied after blooming is more than adequate. A good thick layer of mulch will help retain moisture and keep weeds in check as well as provide a nice-looking backdrop for your plants. After flowering, prune dead flowers to just above where new shoots are beginning to show. This is also a good time to cut back some of the oldest stems growing from the center of the plant. These should be taken out all the way to ground level. Any damaged branches or those that rub on another should be pruned out as well. If the plants are getting too tall, you can cut them back - but leave at least two thirds of the height. Lilacs bloom on previous year's growth, heavy pruning will reduce flower production in the following year. Mature plants will produce offshoots in the form of suckers out of the base. These can be taken up and planted elsewhere to increase your collection. The most common ailment is powdery mildew which can easily be controlled if caught in the early stages, but can easily overwhelm and kill your plant if left untreated. Lilacs can last a lifetime if grown and pruned properly, repeating their outrageously bold and fragrant display of blossoms year after year.